Temperature sets limits to animal performance through its effects on biochemistry and physiology. So if we want to predict the impacts of global climate change on animal distribution and abundance, we must understand the mechanisms that determine the limits of stress tolerance. We study how and why the thermal environment sets limits to individual performance and survival, and how differences in tolerance among individuals, populations, and species arise. In other words, why can one animal survive a canadian winter while another cannot? By integrating observations at the molecular, cellular, tissue, organ, and whole animal levels we strive to build and test conceptual models that can explain thermal limits. Using these models as a backbone for new questions, we study the mechanisms that allow for the wide variation in thermal tolerance we observe in nature. To find information on our research history, see the Publications page. To find out what we are up to at the moment, read on! Although some insects are adapted for life in the cold, the majority of insects cannot survive exposure to low temperatures, let alone freezing. Like humans, these "chill susceptible" insects are instead injured and killed by relatively mild drops in body temperature. 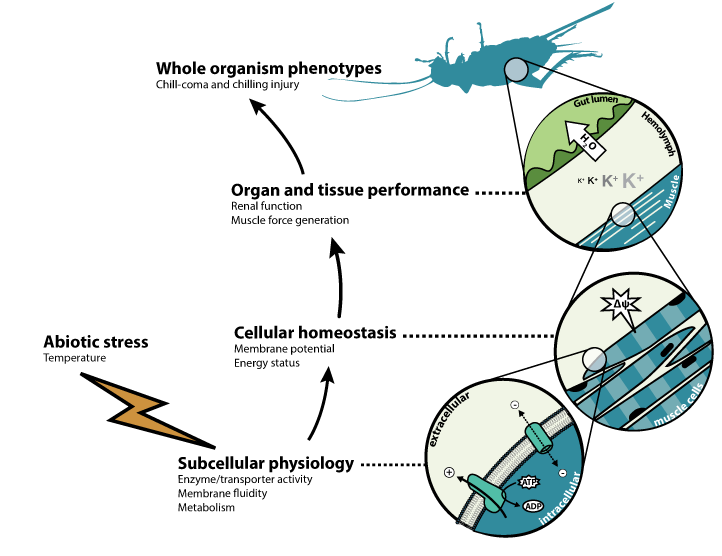 We use an integrative approach to examine how a loss of ion and water homeostasis leads to a progressive rise in extracellular potassium (hyperkalemia) in a diverse range of animals, including insects and crustaceans. This hyperkalemia depolarizes cells, and is thought to subsequently initiate cell death (mainly through apoptosis). We are examining how various aspects of an insects physiological status impact the tendency to drift away from ionoregulatory homeostasis, and how the downstream effects of hyperkalemia drive cellular and whole animal injury. Example publication: MacMillan et al., 2015. Concurrent effects of cold and hyperkalaemia cause insect chilling injury. Proc. R. Soc. B Biol. Sci. 282, 20151483. A suite of recent evidence has allowed us to build a crude model of the proximate physiological mechanisms underlying chill coma onset and recovery as well as chilling-induced injury in insects. Central to this model is the idea that a failure to maintain extracellular ion and water homeostasis is a principal cause of low temperature injury. The insect renal system is responsible for the maintenance of hemolymph ion homeostasis, and as such it represents both a critical target of cold induced failure and an important potential site of thermal adaptation and plasticity. The insect renal system is also under tight neuroendocrine regulation, and as such insect neuropeptides may be essential in coordinating rapid responses to thermal challenges. Mainly using Drosophila as a model, we are examining precisely how the various components of the insect renal system are affected by low temperature, whether the endocrine system coordinates thermal plasticity, and how disruption of endocrine signalling can alter cold tolerance at the level of the whole animal. Example publication: MacMillan et al., 2015. The capacity to maintain ion and water homeostasis underlies interspecific variation in Drosophila cold tolerance. Sci. Rep. 5, 18607. The foregut of a transgenic fruit fly with green fluorescent protein bound to a major component of the septate junctions. The milieu of various body compartments are efficiently separated by paracellular junctions that bind together epithelial cells. These junctions are critical components of the hemolymph-brain and hemolymph-gut barriers in insects, and are thus requisite for survival, but their structure and function are poorly understood in insects relative to vertebrates like ourselves. We are particularly interested in how abiotic stress impacts junctions structure, stability, and permeability and how stress tolerance adaptation and acclimation shape barrier function. Along the way we are learning new and exciting information about the basic biology of these understudied cellular components. Cold acclimation can massively reorganize the Drosophila transcriptome. Figure from MacMillan et al. (2016) Scientific Reports 6: 28999. How do patterns of gene expression change with time spent at low temperatures, and can we use these patterns to better understand how thermal plasticity works? Is there overlap in the genes that show differential expression following cold acclimation and changes in metabolite concentrations observed at the whole animal level? We use modern bioinformatic and biochemical methods to characterize and interpret the massive reorganization of gene expression and metabolic function that occurs upon a change in environmental temperature. At present, we are working to deepen this understanding through a particular focus on the organs and tissues most relevant to chilling tolerance. Example publication: MacMillan et al., 2016. Cold acclimation wholly reorganizes the Drosophila melanogaster transcriptome and metabolome. Sci. Rep. 6, 28999. In the real world, animals can encounter multiple environmental stressors simultaneously, but our current understanding of stress tolerance is mostly limited to single stressors acting independently over short time scales in the lab. We are interested in how various stressors (both biotic and abiotic) interactively impact tissue and organ physiology, and how these interactions manifest to alter stress tolerance traits at the organismal level. Right now, we are particuarly interested in the impacts of changes to the diet on thermal tolerance, and how hypoxia and desiccation may interact with thermal stress to influence water and ion balance. Example publication: Yerushalmi et al., (2016) Chronic dietary salt stress mitigates hyperkalemia and facilitates chill coma recovery in Drosophila melanogaster. Journal of Insect Physiology 95: 89-97.